Waters that are used for drinking, manufacturing, farming, and other purposes are degraded in quality as a result of the introduction of contaminating constituents. Organic wastes, suspended solids, bacteria, nitrates, and phosphates are pollutants that commonly must be removed. To make wastewater acceptable for reuse or for returning to the environment, the concentration of contaminants must be reduced to a nonharmful level, usually a standard prescribed by the U.S. Environmental Protection Agency. Furthermore, urban stormwaters flowing over lawns, rooftops, and paved surfaces are polluted by lawn chemicals, oil and gasoline spills on streets, plus other substances that become entrained in them as they make their way to a stream, river, or lake. These flows must also be subjected to some form of treatment to make them less harmful to the environment. Restoration of water quality is accomplished through the use of a variety of pollution control methods. In urbanized areas, municipal wastewaters (mainly sewage) generally are conveyed to a point of treatment through sanitary sewers, whereas stormwaters are conveyed to their receiving bodies of water through storm drainage networks. In the past, cities sometimes used combined wastewater collection systems wherein a single sewerage network collected domestic wastewater, industrial wastes, and storm runoff water. But this configuration does not support the level of pollution control required today, and new systems of this type are no longer being built. Sanitary sewers carry some level of flow during all hours of the day and night, whereas storm sewers flow mainly after periods of rainfall. During major storm events, the volumes of water carried by storm sewers are orders of magnitude greater than those carried by sanitary sewers. Wastewaters and stormwaters are subjected to treatment, but the types of treatment generally are quite different. The task of designing and constructing facilities for treating wastewaters falls to environmental engineers. They employ a variety of engineered and natural systems to get the job done, using physical, chemical, biological, and sludge treatment methods. Pumps are used to aerate wastewater in a treatment process unit. Aeration supports biological and other treatment processes. be used for certain types of irrigation (such as golf courses), transported to lagoons where they are evaporated, or discharged through submarine (underwater) outfalls into the ocean. However, outflows from treatment works must meet effluent standards set by the U.S. Environmental Protection Agency to avoid polluting the bodies of water that receive them. The categories of wastewater treatment are primary, secondary, and tertiary, or advanced. The minimum level of treatment required is usually secondary treatment, but some cities and industries are required to install tertiary or advanced wastewater treatment processes for removal of pollutants that are resistant to conventional treatment. Stream classification documents, published by each state as required by the U.S. Clean Water Act of 1977, categorize surface waters according to their most beneficial present or future use, such as for drinking-water supplies, body-contact recreation, and so on. These publications also incorporate stream standards that establish maximum allowable pollutant concentrations for a given stream under defined flow conditions. Effluent standards under the Clean Water Act's National Pollutant Discharge Elimination System (NPDES) are used for regulatory purposes to achieve compliance with these stream standards. NPDES permits are issued to cities or other facilities that regulate the volume of discharge, contaminant concentrations, and timing of discharge so as to protect water quality in the receiving waterbody. Conventional wastewater treatment consists of preliminary processes, primary settling to remove heavy solids and floatable materials, and secondary biological aeration to metabolize and flocculate colloidal and dissolved organics. Waste sludge drawn from these operations is thickened and processed for ultimate disposal, usually either land application or landfilling. Preliminary treatment processes include coarse screening, medium screening, shredding of solids, flow measuring, pumping, grit removal, and preaeration. 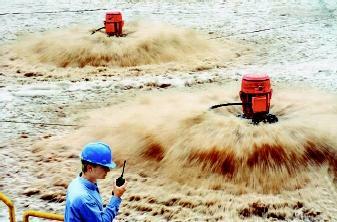 Chlorination of raw wastewater sometimes is used for odor control and to improve settling characteristics of the solids. 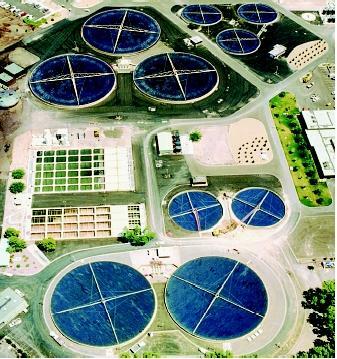 An aerial view depicts a typical wastewater treatment plant supporting primary and secondary treatment. Visible in this photograph are flocculation basins (rectangular), primary settling tanks (foreground), and secondary trickling filters (background). Primary treatment involves sedimentation, and is the process by which about 30 to 50 percent of the suspended solid materials in raw wastewater are removed. Sedimentation must precede all biological filtration operations. The organic matter remaining after primary treatment is extracted by biological secondary treatment processes to meet effluent standards. Secondary treatment commonly is carried out using activated-sludge processes, trickling filters, or rotating biological contactors. In the activated-sludge method, wastewater is fed continuously into an aerated tank where microorganisms break down the organics. The resulting microbial floc (activated sludge) is settled under quiescent (calm-water) conditions in a final clarifier and returned to an aeration tank. The plant effluent is clear supernatant from secondary settling. Trickling filters and rotating biological contactors have media to support microbial films . These slime growths extract organic materials from wastewater as it trickles over the surfaces. Oxygen is supplied from air moving through voids (empty spaces) in the media. Excessive biological growth washes out and is collected in a secondary clarifier. Tertiary wastewater treatment is additional treatment that follows primary and secondary treatment processes. It is employed when primary and secondary treatment cannot accomplish all that is required. For example, phosphorus removal may be needed for wastewaters that are discharged to receiving waters that are likely to become eutrophic, or enriched with nutrients. (Cultural or human-enhanced eutrophication often is associated with nitrogen and phosphorous in effluent.) Water reclamation is achieved in varying degrees, but only a few large-scale plants are reclaiming water to near-pristine quality. Primary sedimentation and secondary biological flocculation processes concentrate waste organics into a volume of sludge significantly less than the quantity of wastewater treated. But disposal of the accumulated waste sludge is a major economic factor in wastewater treatment. Methods for processing raw sludge include anaerobic (biological) digestion and mechanical dewatering by either belt-filter pressing or centrifugation. Conventional methods of disposal are application as a fertilizer or soil conditioner on agricultural land, landfilling in a dedicated disposal site, or codisposal with municipal solid waste. Stormwater treatment includes (1) storage in retention ponds where evaporation and seepage take place, and (2) diversion to natural or artificial wetlands , where pollutants are removed by vegetation and sedimentation and water is returned to the atmosphere by evapotranspiration. These methods take advantage of the ability of natural filtration and biological processes to aid in restoring water quality. Under certain circumstances, chemicals may also be introduced as treatment aids. As noted above, the principal method used for stormwater treatment is storage wherein natural processes of sedimentation, evaporation, and nutrient removal take place. Because of the large volumes of water generated by storms, it usually is not practical to divert these waters to treatment plants such as those used to process municipal and industrial wastewaters. However, a number of devices can be inserted into stormwater systems to achieve various levels of removal of solids and other constitutents. These devices employ features of some of the components of wastewater treatment plants described previously. SEE ALSO Clean Water Act ; Landfills: Impact on Groundwater ; Pollution of Lakes and Streams ; Pollution Sources: Point and Nonpoint ; Runoff, Factors Affecting ; Septic System Impacts. Arms, Karen. Environmental Science. Philadelphia: Saunders College Publishing, 1990. Cunningham, William P., and Barbara Woodworth Saigo. Environmental Science: A Global Concern, 5th ed. New York: Wm. C. Brown/McGraw-Hill, 1999. Hammer, Mark J. Sr., and Mark J. Hammer Jr. Water and Wastewater Technology, 4th ed. Englewood Cliffs, NJ: Prentice Hall, 2001. Loganathan, D., D. Kibler, and T. Grizzard. "Urban Stormwater Management." In Water Resources Handbook, ed. Larry Mays. New York: McGraw-Hill, 1996. Makepeace, D. K., D. W. Smith, and S. J. Stanley. "Urban Stormwater Quality: Summary of Contaminant Data." Critical Reviews in Environmental Science and Technology 25 (1995):93–129. ReVelle, Penelope, and Charles ReVelle. The Environment: Issues and Choices for Society, 3rd ed. Boston, MA: Jones and Bartlett Publishers, 1988. Viessman, Warren Jr., and Mark J. Hammer. Water Supply and Pollution Control, 6th ed. Menlo Park, CA: Addison-Wesley, 1998.